Searching for a used Ram 1500 in Colorado Springs, CO might not be as hard as you think. Ever since Dodge and Ram split back in 2009, the Ram trucks have vastly improved. That doesn’t mean any trucks produced before 2009 by Dodge are bad, just that anything after that is even better. In particular, the 2014 Ram 1500 is a great year to buy. It has the same dependable design as the 2013 models, with the addition of a diesel engine option in 2014 that plays a significant role in boosting the 1500’s capability to save fuel; and appeals to buyers looking for a used truck with a good blend of power and efficiency. 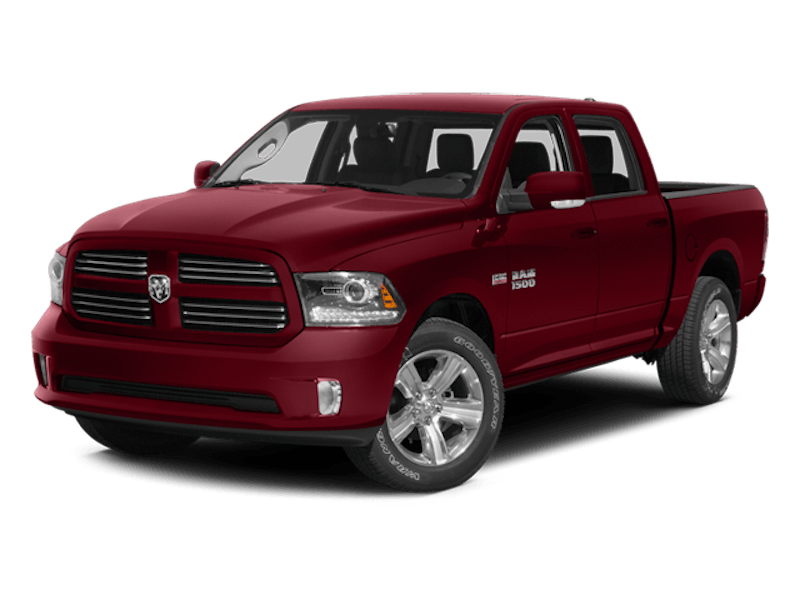 Not too mention, the value for your dollar when buying a used 2014 Ram 1500 is top-notch. The depreciation has already taken most of its toll, which means the resale value is higher compared to that of a new truck; and it was considered a top-segment truck of its time by many. Depreciation is an unavoidable and unfortunate factor that comes into play when buying a new vehicle. As soon as that vehicle leaves the lot, the value of it is immediately reduced by approximately 10 percent on average. As time goes on, the vehicle loses even more of its value, eventually hitting a point in time — about four years down the road — when it finally stops losing value. But by the time it reaches that point, the vehicle has lost about 15-20 percent of its value; and reselling it will only provide a portion of the sum the owner originally paid for it. Bad for the new vehicle seller, but great news for the used vehicle buyer. Based on this info pulled from Carfax, a 2014 Ram 1500 after being off the market for two years has already lost ten percent of its value. That means a used vehicle that’s only two years old is already thousands of dollars cheaper than a new 2016 model. On top of that, the value for your dollar is much greater. Will it depreciate more? For another two years, yes; but in the end, it won’t amount to nearly as much of a financial loss as owning a new vehicle for four years. Besides, Ram trucks are built to last. So, that 2014 model will have no problem lasting as long as the 2016 one if it’s properly maintained. Before diving into the performance and engines of the 2014 Ram 1500, it’s important to highlight a few important elements; all of which made this a top-segment truck in the 2014 model year. Many highly-respected vehicle research websites like Edmunds have glowing reviews about this truck. As far as consumer reviews, this truck receives an overall 4-4.5 star rating across these websites. To be more specific, the expert review from Edmunds field team is a great place to see the pros and cons of this vehicle. The 2014 Ram 1500 was their top pick in the full-size pickup segment because of the strong powertrain options, smooth ride, and well-appointed interior. The cons? A higher up-front cost than other trucks, and slower acceleration (compared to the gas-powered engines) when the diesel powertrain is on board. Between the depreciation taking effect, and the fact that this is now considered a used vehicle, that takes care of the high price. Understanding the positive aspects (and how much it used to cost) makes buying a used 2014 Ram 1500 even more of a bang-for-your buck purchase than initially thought. The diesel engine accelerating the Ram 1500 slower than the gas-powered ones is an unavoidable fact, but not a con. Diesels naturally accelerate a little slower than gas engines, but to make up for it, they provide higher torque, better fuel economy, and much more sustained power at lower RPMs for better towing. Apart from being the only light-duty diesel powered truck in 2014, which means it gains all the benefits of a diesel engine mentioned previously, it also has one of the nicest interiors for trucks from the 2014 model year. Even at the lower levels, the materials are high-quality, and the design is geared towards a comfortable and practical ride. Find a luxury 2014 Ram 1500 Laramie model, and the wood-grains and leather upholstery create an even more luxurious and upscale environment. When looking at the difference between performance in the 2014 and 2016 models; not much has changed. The introduction of the turbocharged diesel engine in 2014 was (and still is) a huge deal for Ram trucks. The first engine option is the 3.6-liter gasoline V6 engine, and comes standard on Tradesman, HFE, and SLT trims. This engine generates a modest 305 horsepower and 269 lb-ft of torque, which provides a good blend of capability and efficiency. Most engines are paired to an eight-speed automatic transmission — a six-speed automatic comes with the stronger 5.7-liter — that comes with a rotary e-shift knob on the instrument panel; opposed to a shifter in the center console. The fuel economy of the 2014 Ram 1500 equipped with this engine comes in at an EPA estimated 17 mpg city and 25 mpg highway with a two-wheel drive system on board, and slightly less with a four-wheel drive system. On the higher trim levels, and available as optional on all the other trim levels, the 5.7-liter V8 engine with 395 horsepower and 410 lb-ft torque is an option for those who need more raw power when the gas pedal is hit. The combination of high horsepower and torque means raw, unhindered power from the moment the truck starts moving and until the brakes are applied. The six-speed is paired to this engine, but only on the Tradesman trim level. With two-wheel drive and the six-speed automatic on board, the 1500 is able to get 14 mpg city and 20 mpg combined (slightly better with the eight-speed equipped) and again, slightly less when a four-wheel drive system is preent. However, it’s important to remember the loss in fuel-efficiency is balanced with a substantial increase in power. Making this engine a great option for hauling and carrying heavier loads, with a towing capacity of 10,450 pounds; which is much larger compared to the 7,450 pound towing capacity of the gasoline V6 engine mentioned earlier. Finding a used 2014 Ram 1500 with a diesel equipped means the owner is in possession of a truck that sat very close to the top for performance in the 2014 model year. The turbocharged diesel engine boasted some extremely impressive fuel-efficiency for a truck in 2014. With two-wheel drive equipped, this truck is able to get an EPA estimated 20 mpg city, and 28 mpg combined. Putting the icing on the cake, this engine also has a low horsepower to torque ratio — 240 horsepower and 420 lb-ft torque — with a towing capacity of 9,200 pounds. This engine bridges the gap between work and efficiency nicely, but lacks the raw power offered by a gasoline engine like the 5.7-liter V8. Instead, making up for it with more power in lower RPMs that smoothly and steadily builds-up through gear changes. The difference lies in our beliefs and approach to the automotive industry. As The Faricy Boys, we have real people with genuine kindness and professionalism ready and waiting to change the way you look at buying cars from a dealership. The fact we have been family owned for over 73 years should be proof enough of that. Our commitment to having real prices with no hidden fees is rivaled only by the respect and care we have for our customers, and a free CarFax report available on every used car helps create a more transparent buying process for everyone. If you do buy from us, our expertly trained service department will make sure your used car or truck stays healthy. At Faricy Boys, its all about professional, knowledgeable, and honest service done with a smile. That’s why we’re different.